Order Your UUCPA Side with Love Shirts! Do you have a Side with Love t-shirt? They are great for anyone who participates – or might participate – in rallies, vigils, marches or other public witness activities. It will be easy to find others from UUCPA in a crowd when they are wearing these shirts, demonstrate our commitment to siding with love rather than hate or fear, and will help others find out about us. 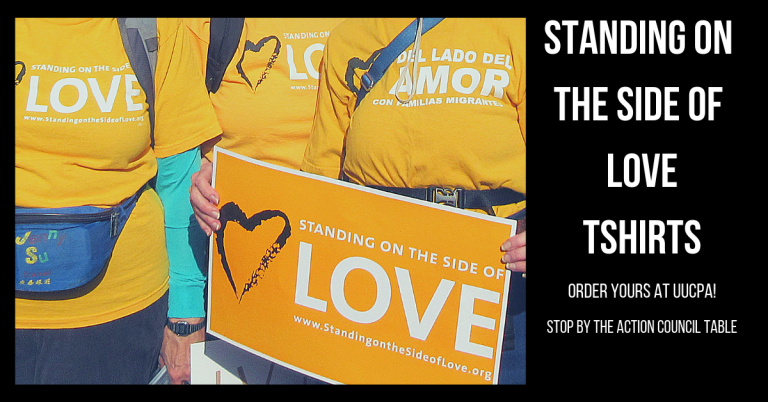 The Action Council will be taking orders for Side with Love t-shirts that have our church name on them at the Action Council Table on the patio beginning Sunday, February 10. Stop by and sign up to get yours!